mesh from the standard 4.8m x 2.4m sheets to 100 x 100mm wrapping fabric. Here at Foregale, we specialise in the manufacture and supply of cut and bent fabric reinforcement mesh from the standard 4.8m x 2.4m sheets to 100 x 100mm wrapping fabric. We also have 3.6m long x 2.0m wide, and 2.4m x 2.4m wide sheets that are cut and bent to order. We stock standard size sheets and also offer a distribution service around the UK from our depots in Hull and Liversedge. 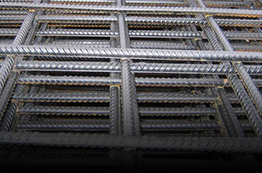 Over the years, steel rebar has been used in the construction industry and beyond to reinforce concrete to absorb tensile forces in the material to ensure that any cracking (which is inevitable) in high-strength concrete does not weaken the overall structure in question. Concrete is naturally a brittle material – it performs well in compression but is far less effective where tension is concerned. Concrete technology has come on in recent months and years, and these days you can now use fibre and mesh reinforcement in order to control these cracks, although you’ll find they are less effective for structural strengthening. Where the structure needs strengthening with steel reinforcement, it’s usual to see high-tensile steel bars and fabric mesh used together. Not only does fabric reinforcement help improve crack control, it can also improve impact resistance, reduce the incidence of bleeding and segregation of aggregates, and also reduce permeability following the curing process. This could be why it’s being increasingly used for crack control over steel reinforcement.